It’s apparent to everyone today that the world is going through an ecological crisis. Wilderness is disappearing fast as whole ecosystems – from forests to grasslands to marshlands – are becoming endangered. For the past two centuries, factories have spewed forth pollution into the atmosphere, poisoning the very air we breathe while lakes, rivers and even the ocean have been transformed into festering sludge-pits. So much has the earth been altered that even its chemistry is changing, the build-up of carbon dioxide threatening the delicate climatic balance of the past 11,000 years, acidifying the ocean and wrecking havoc with the weather. One could be forgiven for concluding that humankind is nothing but “a cancer on the earth”. Humanity has not always been so destructive of nature. Every human society enters into a unique relationship with nature, which surrounds it. For almost all of its two-million year existence, humanity has actually lived in relative harmony with the environment. The isolated hunter-gatherer bands that made up human society until around 6,000 years ago were dominated by their environment rather than dominating it. Their ability to survive was dependant on the abundance of game, or what food their communities could gather or grow. Their direct dependence on the land is still reflected in indigenous cultures the world over, who maintain a reverence for the earth. However, as people came to live more settled lives, societies became more complex and more hierarchically structured. Some people became kings and great lords who lived not by making their own wealth but by exploiting that of others. A salient feature of all such class societies is the destruction of the environment, because exploiting other people also requires exploiting the environment from which those people obtain their wealth. Deforestation was a major problem in the ancient world. The forests of the Mediterranean were cut down for wood and charcoal, leaving little scrub and bare rock in their place. Deforestation in the highlands north of Iraq caused so much soil to wash down the rivers that the coastline of the Persian Gulf was altered. Through the middle ages, the exploitation of nature extended deforestation into the heart of Europe, while rudimentary farming techniques impoverished the soil. Capitalism has raised the exploitation of nature to new heights. Like previous class societies, capitalism revolves around the exploitation of workers and the earth. Unlike previous class societies however, this exploitation has no limit. In previous societies, exploitation was limited by what the ruling class could consume. Exploitation was direct and brutal. Under capitalism, everything is a commodity that can be exchanged for money. And since there is no limit to how much money the capitalists can accumulate (it can always be invested to ‘make’ more money!) there is no limit to the exploitation of either workers or the earth. Capitalism generates a division between the town and countryside whereby wealth is sucked out of the earth and transported to the cities, where it is accumulated by the capitalist class. Raw materials are broken down into their constituent parts; useful elements being retained and accumulated in the form of factories, offices, great mansions etc., and waste elements are dumped. By concentrating wealth in great centers of industry capitalism thus robs the earth of its vitality, severing ecological cycles and creating a one-way flow of resources. Where efforts are made to revive the productivity of the earth it is usually through the application of minerals taken from other parts of the planet, not by returning wealth to the earth as a whole. As Marx put it, the metabolic relation between humanity and the earth is severed as capitalism accumulates mountains of wealth on the one hand, and mountains of poverty, misery and desolation on the other. If humanity is to have any chance of re-entering a sustainable relationship with nature, we need to stop the rot at its source: capitalism and class society must be gotten rid of. The current exploitative system must be replaced by one in which humans are not divorced from nature, but become the conscious aspect of nature. Doing that requires a revolution: we must get rid not only of the exploitation of nature, but also the exploitation of one human being by another. To capital, nature appears as a sort of “free gift” in the process of accumulation. Raw materials from nature require little or no labour to be transformed into commodities that can be sold on the market. Previously, when money was backed by gold, profits could be made by simply pulling the requisite amount of precious metals out of the ground. In a similar manner, commodities in other primary industries are extracted directly from nature (although profits are less certain). Cows produce a minimum of milk and meat independently of the action of the farmer, for example, fruit grows on trees and coal is found underground in a more or less useable form. While vast sums can be spent on increasing and improving natural products, primary industries are in the unique position in that they receive a portion of their raw material (and thus their product) without having to purchase it. This is important because the very accumulation that is at the centre of capitalism plunges it periodically into crisis. Beyond the all but the most rudimentary industry, the workers’ labour is needed to transform natural elements into useful products. Workers’ labour is thus the source of all new value, and hence of all profits. However, as capitalist accumulation proceeds more and more accumulated capital comes to be applied to any amount of living labour, resulting in smaller profits being generated from any given amount of capital invested. It becomes harder and harder to make a profit, until there is no longer any incentive for investment and the system plunges into crisis. It is just this sort of crisis that we are going through today. The tendency towards crisis forces capitalists towards an ever more savage exploitation of both workers and the environment. As the crisis proceeds, capitalists around the globe are attacking working class wages and conditions, trying to increase the production of new value by making workers work longer, harder and faster for less. Basically, the capitalists are attempting to increase the amount of labour beyond that which is required to produce the workers wages – increasing the time the worker is effectively working for free. The economic crisis also adds further fuel to the environmental crisis by driving capitalists to increase appropriation of “free goods” from nature. Thus, the onset of the crisis in 2007-08 was announced by a surge in speculation on commodities such as gold, oil and food, in an attempt to find guaranteed returns. 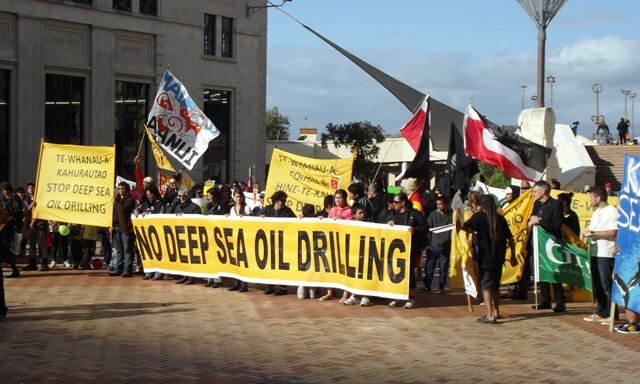 In Aotearoa, expanding mineral, oil and gas extraction is one of the key ways that the National government is attempting to promote economic recovery. Both the number and size of mines have increased since the National government was elected in 2008. “Fracking” is already underway in Tarankai and could be extended to other regions, and of course multinationals are prospecting up and down our coasts to assess reserves of oil and natural gas. The developments in Aotearoa are part of a global trend. The pressure on profits has seen capitalists chase after the earth’s mineral wealth ever more recklessly. Mining has been expanded over the past decade to ever more marginal areas with little regard for the safety of either the environment or the mine workers– with tragic results as we saw at Pike River. Oil drilling is pushed ever deeper into the ocean, increasing the risk of catastrophic oil spills and ever-more destructive techniques are invented in desperate attempts to get the last bits of oil, gas and coal from the ground. Whole mountains are destroyed, rocks ground up in the search for “black gold” and huge volumes of liquid are pumped into the earth to release gas by fracturing the very bedrock we rest on. capitalism approaches its limits it stumbles and falls, seemingly under its own weight. The resources crisis is a reflection of this. The supply of fossil fuels is not unlimited, yet a continuous supply of them appears to be essential to the running of modern capitalism. Oil, in particular, is likened to a drug that capitalism can’t do without. Almost mystical powers have been attributed to the precious liquid. It’s supposed to be a fuel like no other, uniquely suited to producing the smooth, continuous flow of energy required by modern industry. Some even go so far as to look to the end of oil as precipitating the end of capitalism. Unfortunately, the truth is somewhat more complicated. The end of oil won’t by itself be the end of capitalism because oil is not the wonder-fuel it’s made out to be. The supply of oil is far from continuous, as the oil shocks of the 1970s made abundantly clear. Far from being uniform, the energy derived from burning fossil fuels varies depending on the availability of oxygen. The easily accessible, continuous supply of energy we receive from oil today is a result of the application of technologies like the internal combustion engine, which manipulates the properties of oil to produce a desired result. Central to capitalism still is workers’ labour, not oil. If it won’t necessarily collapse without oil, could capitalism overcome its environmental crisis? Clearly not. An un-ecological, unsustainable flow of resources lies at the very heart of capitalism. However, capitalism should not be identified with any one of these resources – it is possible that capitalism could transfer its dependence to some other form of energy. But it would come at a massive human and environmental cost. Witness the massive tracts of rainforest being cut down for “eco-friendly” bio-diesel, for example, or the swamping of whole villages and ecosystems to make way for hyrdo-electric dams. Competition with “clean and green” power sources would also propel the mining industry to redouble their efforts to compete by pulverizing the earth for every last drop of oil and the very last lump of coal. We can’t wait around for capitalism to green itself, or collapse under its own weight. It will have to be pushed. Waiting for capitalism to collapse of its own accord, however, misses the point. Because crises are inherently destructive, they generate resistance. Creating a new world out of one wrecked crisis requires activists not to simply impose their own schemas of what we think a sustainable, post-capitalist world might look like, but actively working with those who are fighting to put their needs before those of the moneyed elite, and raising those needs to the level of a political programme. The struggle for revolution begins by struggling for the here and now. Today, there is a multiplicity of different groups fighting for environmental justice. From 1080 dumps to toxic spray drift, to mine dust and sewage backflow, to acid rain and city smog, the environmental crisis affects almost every community. For some, it is even more acute. The very identity of iwi and hapu has been shaped by their land over hundreds of years, and few take the wrecking of those lands lightly. Further afield, millions are threatened with displacement and impoverishment by rising sea levels, the drying of the Ganges and other climatic changes. Environmentalists have no shortage of people to organize with. Amongst these diverse forces is one that has the power to shake capitalism to its foundations: the working class. Workers have their hands literally on the very levers that make capitalism work, and by organizing together they can bring the system to a standstill. The intervention of organized workers has been crucial to winning environmental battles in the past. During the anti-nuclear campaign of the 1970s and 80s, wharfies met with protestors in Auckland and put a ban on unloading of nuclear-powered ships, forcing the government to take an anti-nuclear stance. At other times, building unions have put “green bans” on sites of cultural and environmental importance, to prevent their being developed. Without one such ban, the Sydney Opera house would no longer be standing. Another was put on Bastion Point during the struggle of Ngāti Whātua against the Auckland Council. These tactics could be used again. solutions to struggle offered by the state may come up short – as in the case of Sealords, which despite being 50 % owned by iwi continues in unsustainable fishing practices like those found in any other corporation. Critics are always quick to point out that the working class is too weak or too divided to lead a struggle. To be sure, transforming the many struggles against oil drilling, coal mining, for the conservation of flora and fauna and for sustainable industry into an all-out struggle against capitalism will require a leap in working class consciousness and organization far beyond what exists today. Unions are only just coming out of decades of being on the defensive, and workers are far from united. It will take a whole period of building new political structures and links within the workers movement and amongst all the oppressed before a revolution can succeed. But fortunately that process is already underway. The more it destroys the environment, the more the vicious, blood-sucking agenda of capitalism generates resistance at the heart of the system. That is what the disputes like those at the Port of Auckland and AFFCO meatworks are really about. The heroic resistance of environmental activists and of iwi like Te Whānau-ā-Apanui is accelerating this process, making working people everywhere more aware that their exploitation goes hand-in-hand with the ruination of the planet and that their final goal must be one of harmony with the planet, not its continued destruction.